Well, that’s .013 - apparently some have been sent 0.19 but for some reason this version has not been posted in the test firmware directory! So, whilst .019 may be a big improvement for some, I am still suffering from constant disconnects with .013! Thanks for your feedback. Please continue testing. I just spent almost two weeks travelling (from the US went to two countries in Europe then over to China (Shenzhen and Shanghai)). Used my AR750S with the .013 firmware the whole time (connecting to a wireguard server at my home). I noticed some disconnects but honestly, I could not tell if it was due to hotel internet or firmware. Despite these drops the router seemed to reconnect fairly quickly and the wireguard client would reconnect without issue after a few seconds. I’ve made no modifications to the .013 firmware and everything has been stock. I’d be happy to test any beta firmware to see if those momentary disconnects continue. The latest testing firmware is v3.019. You can PM me your Email, I will sent it to you. Kindly post it in the testing directory! When the repeater connection is disconnected, the own AP will work abnormally. So when the repeater is disconnected, I will reload wifi to ensure that my AP is working properly. By the way, are you planning also to make snapshots testing firmware for AR750? snapshot folder: It is the latest testing firmware, will update the firmware regularly or every day, such as OpenWRT’s snapshot. testing folder: It is release candidate folder, which also contains release note, won’t update regularly, it only update when some new features added. Thanks for finally uploading the fixed firmware! A forum member had already sent this to me privately, so have tested it already for 24+ hours - it seems the repeater disconnects are fixed, or at least much improved under 2.4 GHz. Thank you for finally acknowledging that there were fundamental problems and addressing them. I am testing it with youtube live video 720p upload. For the last 12HRs its solid working. But not in reperater mode. wireless encoder is connected to 750 from 2.4G (at 270mbit speed) and its connected to wired lan in router mode. 5g is also open. I am experiencing a new behavior with the Slate. It’s not detecting the hotel wifi anymore, it worked great for the past 4 days and today I can access with my phone, but not with the Slate. 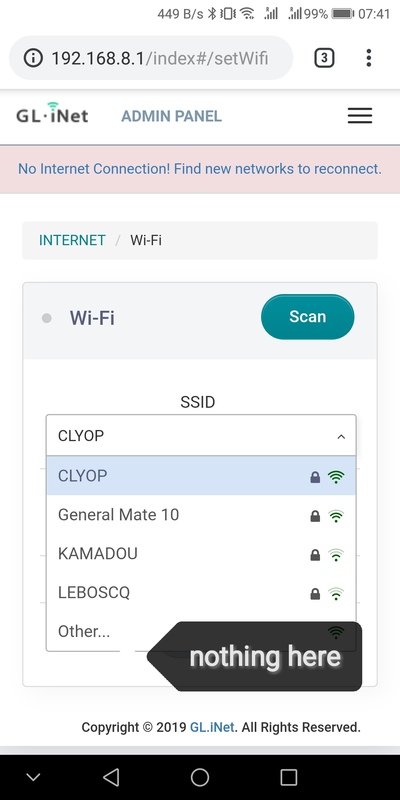 I found out that the Slate isn’t detecting lot of wifi signals, but it doesn’t matter to me, what brothers me is, the hotel router is near my room, I can connect all my devices, but when I scan using the Slate, it won’t show the hotel Wifi any more. That hotel wifi was saved on the system, when I try to reconnect, the Slate returns Wifi not in range!! I rebooted several times, nothing, I even asked the hotel stuff to reboot the hotel router (for the sake of testing) and still the Slate do not find the wifi anymore. Can you do a scan, then ssh to the router and get the log? Luci should be OK. Will have a check. You should scan the network in Luci, the log is not help. Sorry, I am no longer staying there, will test in other environments and report back if I see this problem again. I don’t know how the router handles some wifis but I think maybe it blacklisted the hotel wifi for some reason and then I couldn’t see it anymore? Does it have a blacklist protocol of some sort? It doesn’t seem that way. 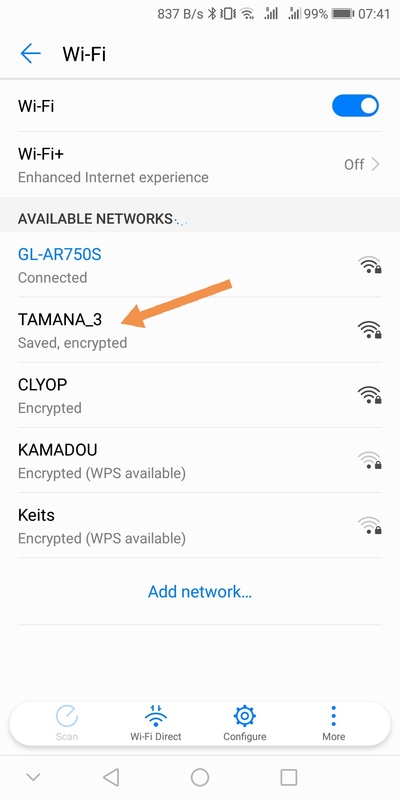 A access point will always broadcast this signal, so station can scan it, unless there has the same BSSID or something else. If AR750S blocks by the hotel WiFi, in general, it only can’t connect it, but still can see it. You can try in other environment and see this problem. Looks like I spoke too soon. In a different AirBNB with a Zyxel router and the Slate repeatedly disconnects for a minute or two. This is with the .19 firmware.